If you’re a mom, back to school means back to school shopping, organizing, and planning, especially menu planning! Your little darlings need breakfasts, snacks, lunches, after school snacks, and dinners! Whew….that’s a lot of food prep! 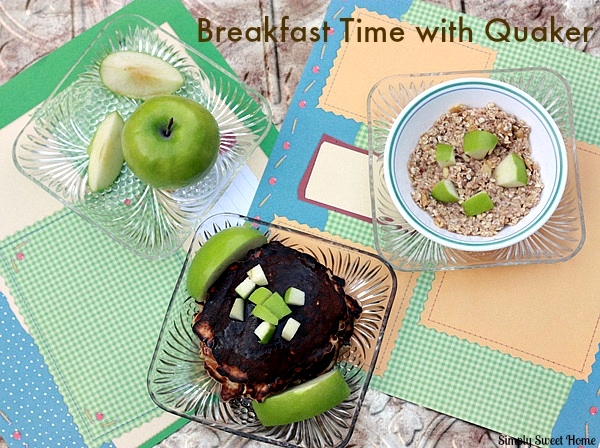 Today I’m talking about just a few options that Quaker gives you help get your through the morning breakfast time, and I’ve got a delicious recipe for Apple Cinnamon Oatmeal Pancakes that you and your kids will love! And to help you get organized in the kitchen this fall, I’ve created a free printable that you can use to create your weekly menus! Yup, it’s going to be a jam packed post, so let’s get started! When it comes to breakfast, Quaker has us covered every way possible with their cold and hot cereals, plus delicious on-the-go options like their Quaker Chewy Bars. And the Quaker products we love most are being offered in value size boxes for the back to school season! I found the value size boxes of the Quaker products at my local Walmart. 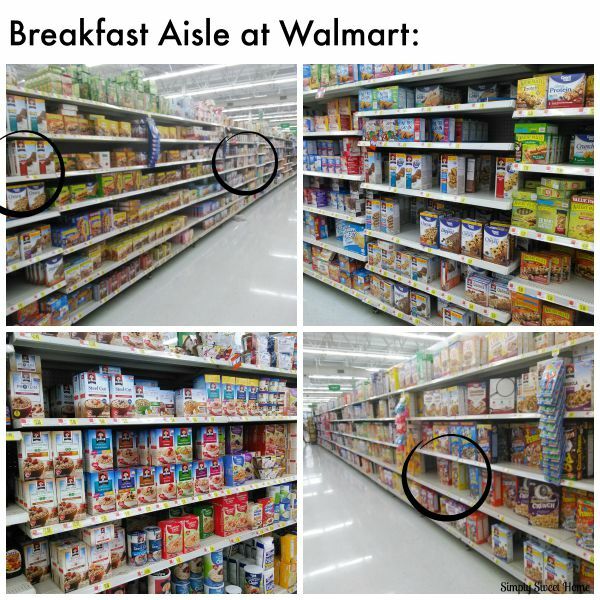 Everything is located in the breakfast aisle. You are, without a doubt, familiar with Quaker cereal. One of my favorites is Cap’N Crunch. 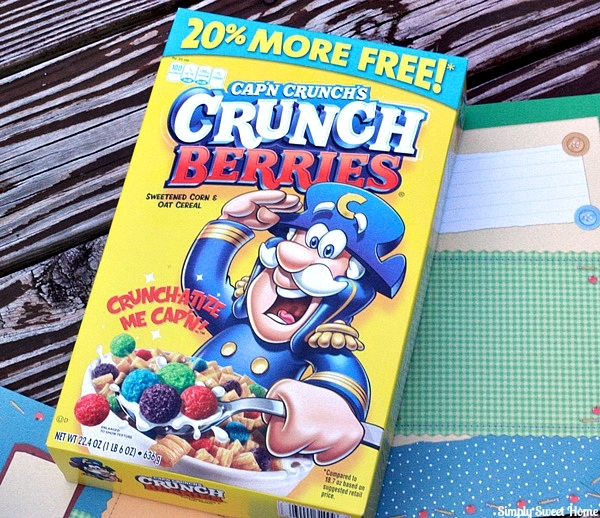 I love it in all of it’s varieties from original to Peanut Butter, but my favorite has got to be Cap’N Crunch’s Crunch Berries! Not only can you serve these with a little milk at breakfast time, but they are also great to put in a zipper bag and send along as a school snack or lunch item. 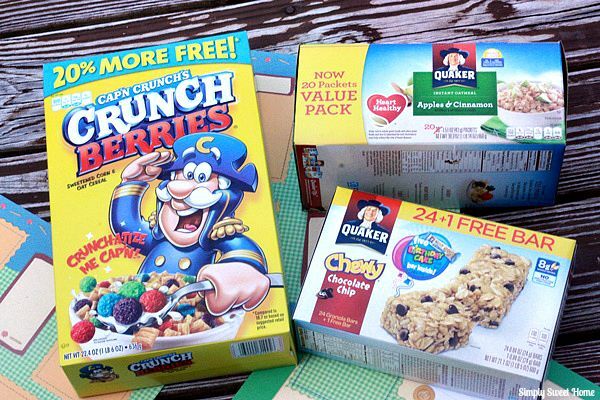 Right now Quaker is offering the product in a value box which includes 20% more cereal FREE! Since these are individually wrapped, they are perfect for Noah to take to school on mornings where we just can’t quite get him out of bed on time. And they are also a perfectly delicious, yet “better for you” option to put in lunch boxes or have for after school snacks. 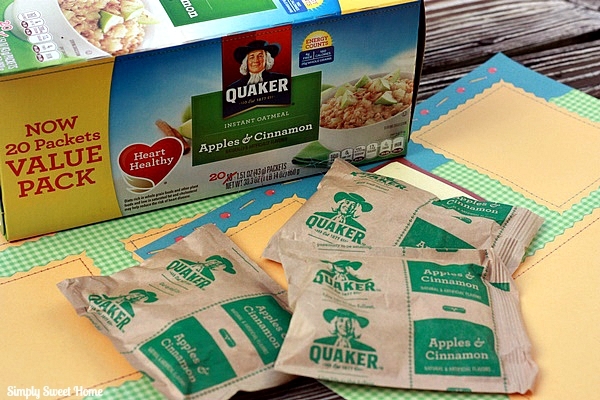 While I was picking up my Chewy Bars, I saw a similar Value Pack of Quaker Instant Oatmeal, in the Apples & Cinnamon variety. This box comes with 20 packages of oatmeal. I love oatmeal. It is such a great comfort food, and it’s one hot meal you can serve up in a snap! I always make my oatmeal with milk, instead of water. That’s just me, and I always love a good mix in or two. For example, I usually add butter and sugar to plain oatmeal. And for the Apples & Cinnamon variety, I like to add just a few apple slices and maybe just a pinch of sugar! Delicious! Now if you have a little more time in the mornings, or if you like to do make ahead breakfasts, here’s something you’ve GOT TO TRY! I made these Apple Cinnamon Oatmeal Pancakes. They take about 20 minutes to mix up and cook. (Not bad for a homemade recipe.) 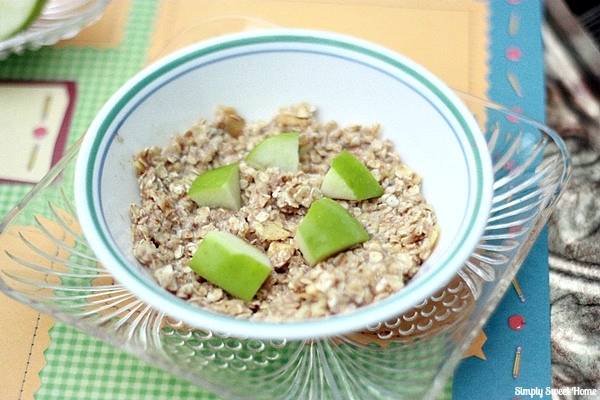 And the star of the recipe just happens to be 2 packages of Quakers Apples & Cinnamon Oatmeal! 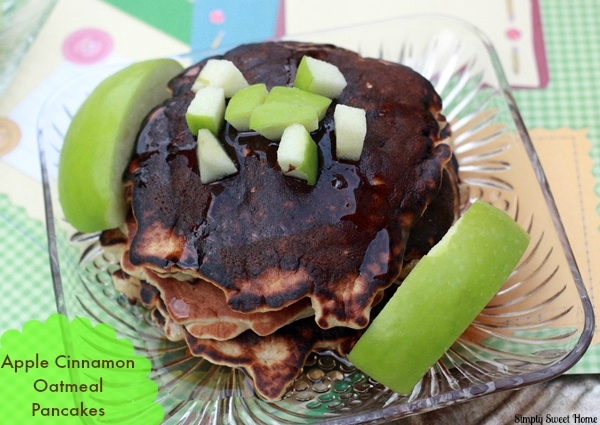 Add your favorite pancake toppings like maple syrup and apples, and it’s a sweet breakfast treat that can’t be beat! Pour one cup of milk in to a microwave safe bowl and heat in the microwave for 1 to 2 minutes. Stir in the oats. Set aside. Mix flour, brown sugar, baking powder, and salt in a separate bowl. Mix dry ingredients. Add eggs, 2 teaspoons of melted butter, and vanilla extract. Whisk together. Add oatmeal mixture. Continue to whisk together, adding a 1/4 cup of milk. More milk may be adding if your batter needs to be thinned out. Next use a griddle or skillet to cook pancakes, pouring the batter out by the spoonful on to your cooking surface. (Cook on medium heat.) Cook side one until pancake starts to bubble on top and get dry around the edges; then flip your pancake and cook the other side for about a minute or so. Makes about a dozen pancakes. Because there is oatmeal in the recipe, this batter is a little different from traditional pancakes. As such, your pancakes may not come out completely round and perfect. But they will be delicious! You may also find that these cook a little faster than traditional pancakes. Need more help planning your meals this fall? Here’s a FREE printable I’ve created just for you! Click here to download this Menu Planning printable. Planning your menus for the week will help you to do inventory in your kitchen and also plan and budget out your next shopping trip. This is also a great way to ensure your kids get adequate nutrition each day. 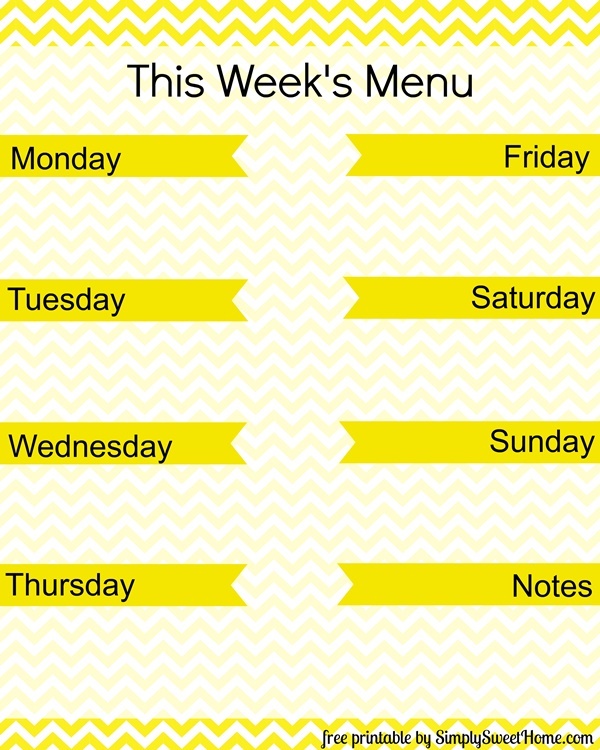 Next, get your kids to help you decide what foods should be on their menu for the week, based on what they’ve learned. (Perhaps they’d like banana slices with breakfast. Maybe they’d like a strawberry smoothie after school.) It is much easier to get kids to eat nutritious foods they have selected! This is a great opportunity to get yourself organized, while also teaching your kids about eating the proper foods and giving them a say in what they’ll eat each day. Make menu planning fun! Do you and your kids love Quaker? 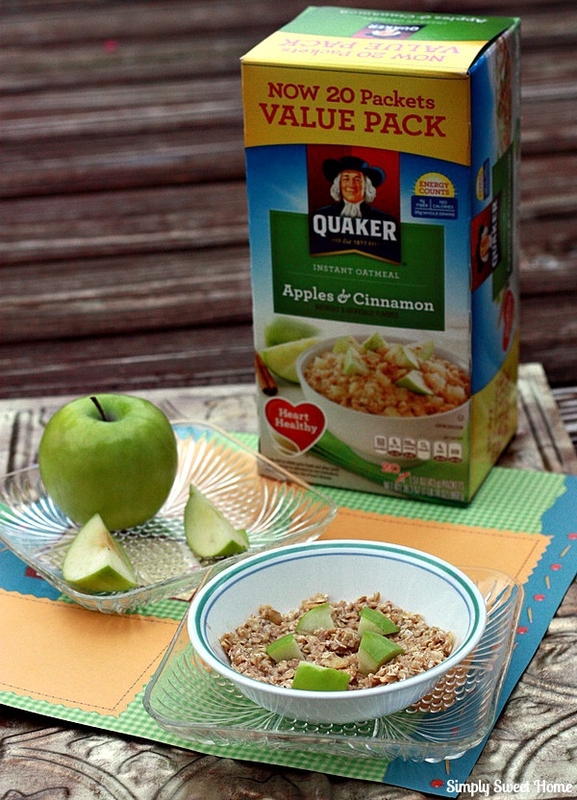 Leave a comment telling me you favorite Quaker products to serve at breakfast time! The pancakes look delicious and fun to make. I love Quaker oatmeal and have it for breakfast all the time. I am going to make your awesome pancakes recipe! Thanks for sharing. Apple cinnamon is one of my favorite flavors! I would love to try this! I love the idea of making pancakes from instant oatmeal! 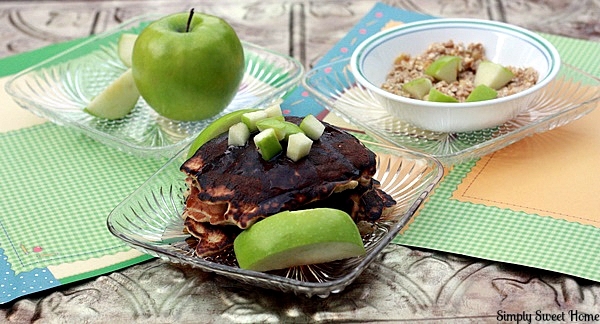 This apple cinnamon oatmeal looks delish as oatmeal or pancakes – gotta have it! These products all look so good and I love the convenience! 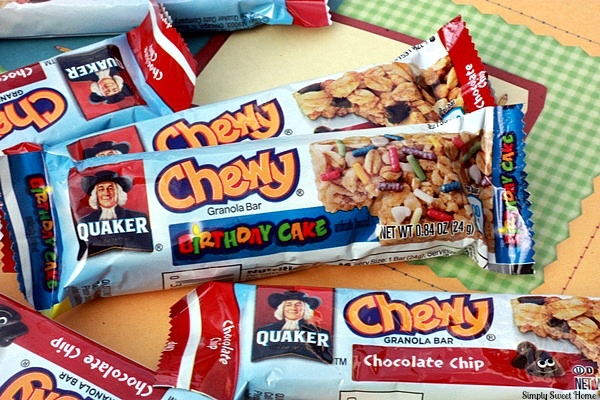 Oh we love Quaker products too! Carter loves the Captain Crunchberries! 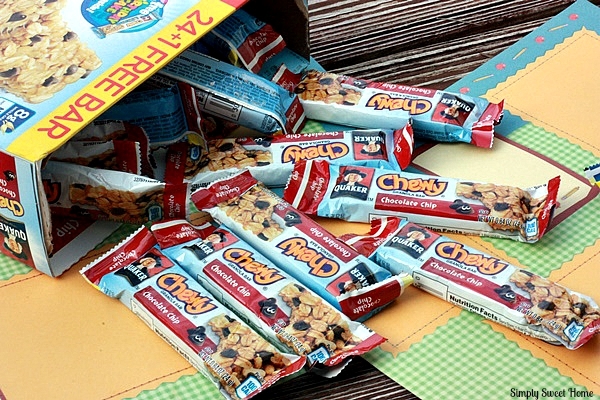 We also really love their granola bars! Those are so easy when in a huge hurry in the morning rather than me skipping breakfast! I love oatmeal and pancakes so I probably would love these ones. I will have to make them for the family.